It used to be enough for outdoor workers or those in difficult environments to make do with an affordable and replaceable mobile phone that just did the basics of talking and texting. Nowadays though, most of us have been exposed to a smartphone revolution that includes email, instant messaging, shopping, GPS navigation and gaming. Few of us want something so basic anymore. The power & complexity makes for relatively expensive gadgets though. Without sacrificing a lot of functionality, smartphones are not cheaply replaceable. As a result, a fair number of manufacturers have tried to carve a niche in manufacturing rugged and resistant devices that can survive drops, dunks, dents and other damage. Known brands such as JCB and Cat have licensed their names to phone manufacturers with varying degrees of success, here we have the Defender from specialised manufacturer The Toughphone. There has been a bit of quite a lot of rugged products released in the past couple of years, so we try to pick out the best, avoiding the glut of unbranded, substandard units that are readily available. The Defender is something different. It might look like other similar robust units – it has a suitably chunky, rubberised, IP-68 rated casing – the team behind its conception have several years’ experience in the mobile phone industry and so are looking to bring a high-end product to this hit-and-miss category. The Defender takes the best of some of the competition and rolls it into a complete package. It has the overall IP rating, thickness and protection of the older JCB Pro-Smart or higher-end RugGear phones, alongside some of the better specifications of the Cat range which compromise on protection for a more svelte design. This includes a recent update in specifications to be running a 1.3 GHz quad-core processor and Android KitKat 4.4 (earlier versions had a slower chip and Jelly Bean 4.2). There are expectations of a rugged phone, one being a high IP rating. The Defender uses a thick pocket-busting casing with a screw-on backplate to reach IP68 – water resistance to 2 metres for up to 60 minutes, as well as complete protection against particle ingress (dust, sand etc.) The unit can take a heavy beating too, bouncing away from falls of over 2 metres. None of this particularly new, the JCB ProSmart was doing the same a couple of years back, however it’s still impressive though to see a fully featured smartphone take a pounding. Plus dropping it in your pint to show your mates never gets old! As well as individuals, rugged devices have also targeted business and enterprise looking to provide a workforce or fleet with a suitably resilient handset. If you manage the type of worker(s) who find themselves in remote areas, then the Push To Talk feature may be of use. The Defender comes packaged with a large walkie-talkie style external antenna that can be screwed in at the top. With PTT, your entire team can stay in touch instantly over the same RF channel. The Toughphone can also supply a bespoke application to allow for instant voice over a mobile network, should you be out of RF range yet covered by a data signal. A last security measure comes in the guise of the SOS button. When held, this will send an alert tone to all other devices in range should any team member be in distress or require immediate attention. NFC is rare on tough devices, the only other standout in my mind is the Cat S50. Commercially useful for contactless payments, and one-touch pairing to accessories, NFC can also be used in the workplace. If you are considering rolling out the Defender to a workforce, then NFC tags can be distributed in key locations as part of a workforce management app or for other bespoke applications. Finally, the Defender is dual SIM, so you can have two active SIM cards at any one time. This is great if you wish to run a personal & work contact list from the same device, or should you want to double up on the coverage for your handset. Nice if you regularly find yourself in areas where one network has superior signal to another and your primary provider often drops out. The Defender is by no means the first of its kind and it certainly won’t be the last. It is however refreshing to see a relatively unknown brand manufacture a polished rugged device. It doesn’t just tick all the boxes, but does so firmly. There’s little to say concerning performance; on paper this is a modern, mid-specification Android device and it behaves exactly as you would expect. Android KitKat 4.4 runs smoothly on a 1.3 GHz quad core MediaTek processor, which is also capable of powering pretty much any application the intended audience are going to install. Battery life is solid given the combination of processor and lower resolution screen. The basic 4 GB of storage might frustrate some users but as this is primarily a work device, then you shouldn’t be needlessly installing too many apps anyway. The SD card caters for expanded storage for media as well, so you can happily save pictures or put a bit of music on without affecting performance. The screen can be a bit difficult to make out in direct sunlight, however this is standard in this category. Having the toughened shatter-resistant covering sit on top of the touch panel is a necessary evil. Otherwise the IPS panel performs as well as any other. The Defender won’t be setting the world on fire any time soon but it definitely does exactly what it sets out to do. 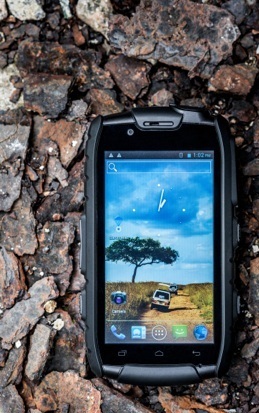 It’s a highly competent and reasonably powerful smartphone, that can withstand the extremes of outdoor work, whilst providing the modern functionality of a more mainstream brand. If you are an outdoor individual or workforce manager looking for a suitable fleet handset, the Defender should be high on your list for consideration.